Download "Safeguarding Children Policy (Early Years Child Protection)"
2 The child s view - Children have the right to say what they think about anything which affects them. When courts or official organisations make decisions which affect children, they must listen to what children want and feel. 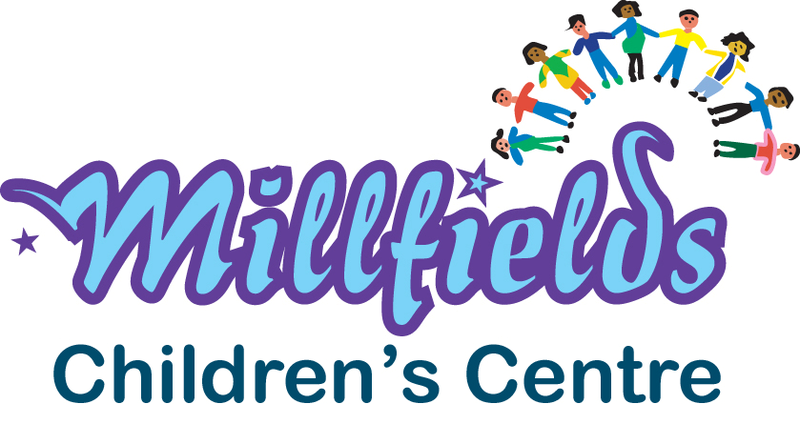 (Article 12) Millfields Children s Centre recognises the responsibilities of all staff in the centre to safeguard children. 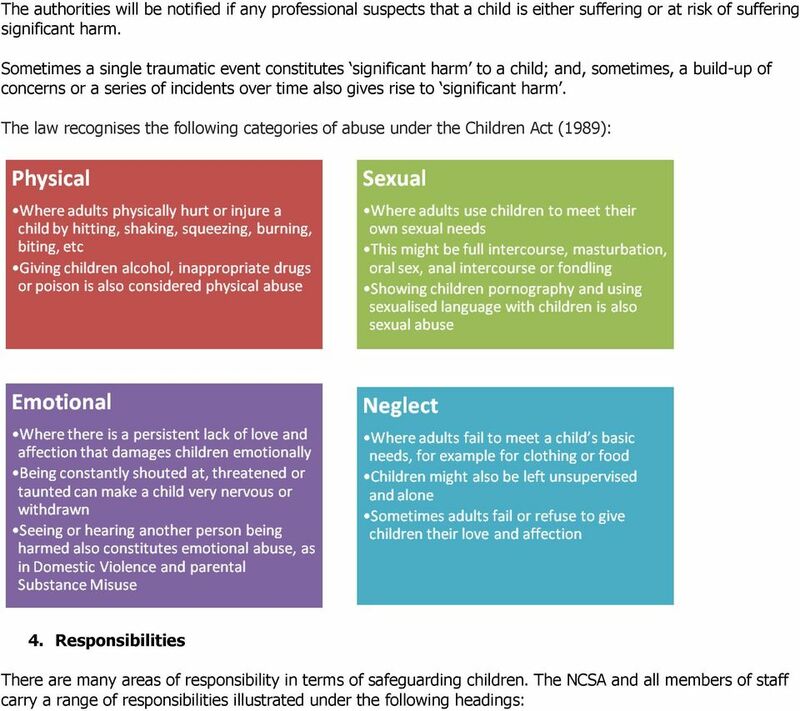 All staff, including volunteers and students and service providers, have an active part protecting children from harm. The aims of this policy are To support the child s development in ways that will foster security, confidence and independence. To raise awareness of staff of the need to safeguard children and their responsibilities in identifying and reporting possible abuse. To provide systematic means of monitoring children known to be at risk of harm. 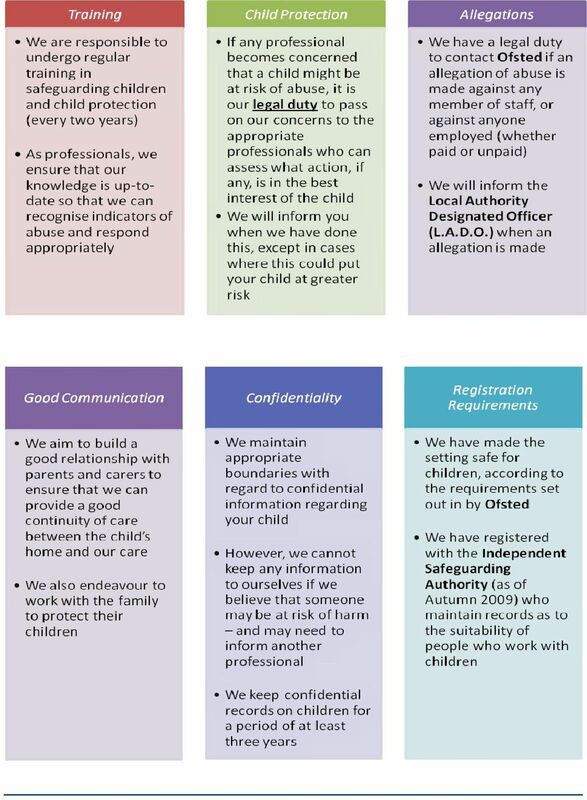 To emphasise the need for good levels of communication between members of staff and between staff and parents/carers To ensure that all staff who have access to children are suitable to do so and have a valid satisfactory CRB check. To ensure that all Early Years daycare staff receive regular child protection training as a condition of employment. 2. 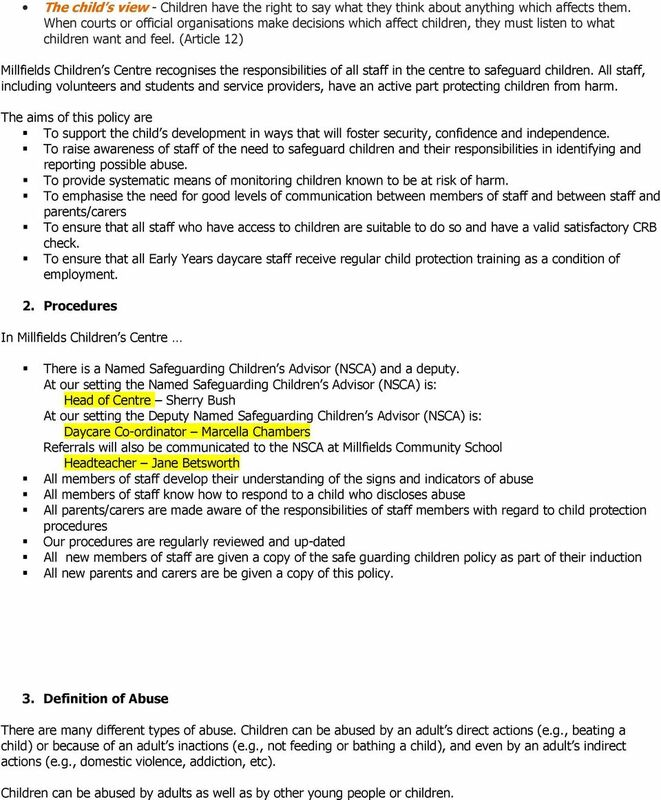 Procedures In Millfields Children s Centre There is a Named Safeguarding Children s Advisor (NSCA) and a deputy. At our setting the Named Safeguarding Children s Advisor (NSCA) is: Head of Centre Sherry Bush At our setting the Deputy Named Safeguarding Children s Advisor (NSCA) is: Daycare Co-ordinator Marcella Chambers Referrals will also be communicated to the NSCA at Millfields Community School Headteacher Jane Betsworth All members of staff develop their understanding of the signs and indicators of abuse All members of staff know how to respond to a child who discloses abuse All parents/carers are made aware of the responsibilities of staff members with regard to child protection procedures Our procedures are regularly reviewed and up-dated All new members of staff are given a copy of the safe guarding children policy as part of their induction All new parents and carers are be given a copy of this policy. 3. Definition of Abuse There are many different types of abuse. Children can be abused by an adult s direct actions (e.g., beating a child) or because of an adult s inactions (e.g., not feeding or bathing a child), and even by an adult s indirect actions (e.g., domestic violence, addiction, etc). Children can be abused by adults as well as by other young people or children. 6 5. What to do if you re worried a child is being abused The practitioner reports the incident they are concerned about to the NSCA as soon as possible They record the incident, recording only what they have observed The NCSA should gather any other or further information that could assist them Concerns should be discussed with the child s parents unless there is a concern that this will place the child at greater risk as may be the case for instances of suspected sexual abuse Before making a decision whether to refer the incident to social services the designated child protection officer may discuss the issues with the Local Authority Designated Officer (LADO) The Incident is reported to social services, and a referral is filled in and sent to social services within 48 hours, or the incident is record in an incident book and the reason for no further action noted 6. 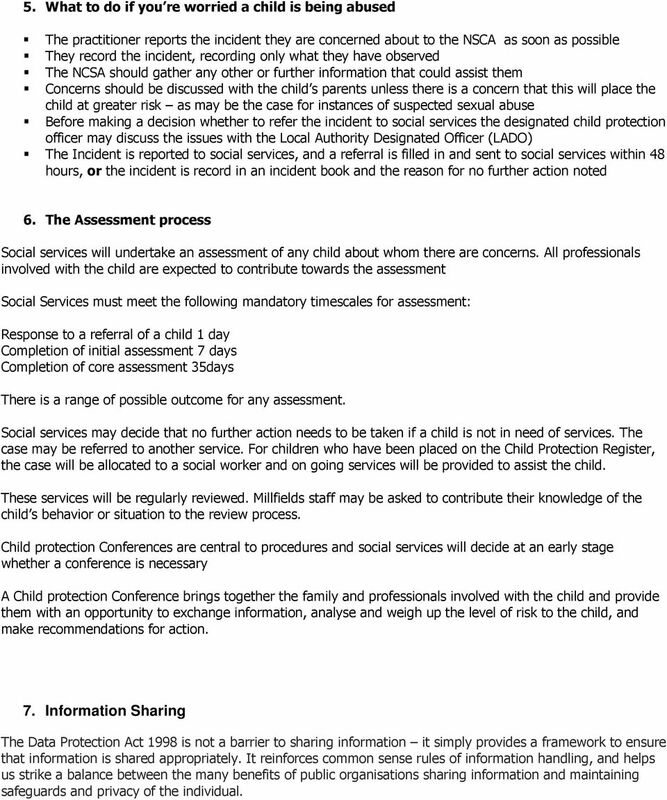 The Assessment process Social services will undertake an assessment of any child about whom there are concerns. 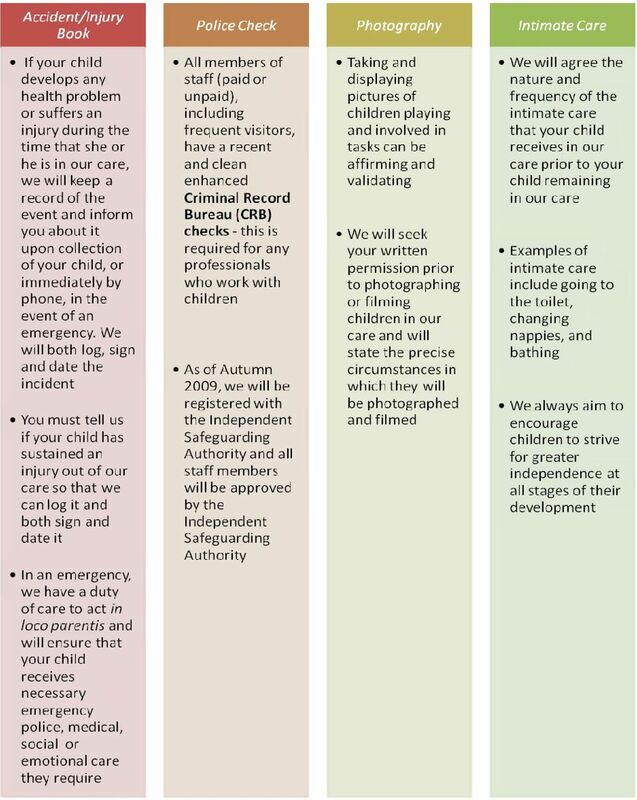 All professionals involved with the child are expected to contribute towards the assessment Social Services must meet the following mandatory timescales for assessment: Response to a referral of a child 1 day Completion of initial assessment 7 days Completion of core assessment 35days There is a range of possible outcome for any assessment. Social services may decide that no further action needs to be taken if a child is not in need of services. The case may be referred to another service. For children who have been placed on the Child Protection Register, the case will be allocated to a social worker and on going services will be provided to assist the child. These services will be regularly reviewed. Millfields staff may be asked to contribute their knowledge of the child s behavior or situation to the review process. Child protection Conferences are central to procedures and social services will decide at an early stage whether a conference is necessary A Child protection Conference brings together the family and professionals involved with the child and provide them with an opportunity to exchange information, analyse and weigh up the level of risk to the child, and make recommendations for action. 7. Information Sharing The Data Protection Act 1998 is not a barrier to sharing information it simply provides a framework to ensure that information is shared appropriately. It reinforces common sense rules of information handling, and helps us strike a balance between the many benefits of public organisations sharing information and maintaining safeguards and privacy of the individual. LANDKEY PRIMARY SCHOOL Safeguarding Policy This school is committed to safeguarding and promoting the welfare of children and young people and expects all staff and volunteers to share this commitment. Altrincham College Child Protection Policy 1 CHIILD PROTECTION Introduction This policy has been developed in accordance with the principles established by the Children Act 1989 and 2004 and related guidance. CLIFTON COMMUNITY SCHOOL Safeguarding incorporating Child Protection Policy Policy Consultation & Review This policy is available on our school website and is available on request from the school office. DEVONSHIRE PARK PRIMARY SCHOOL SAFEGUARDING / CHILD PROTECTION POLICY. 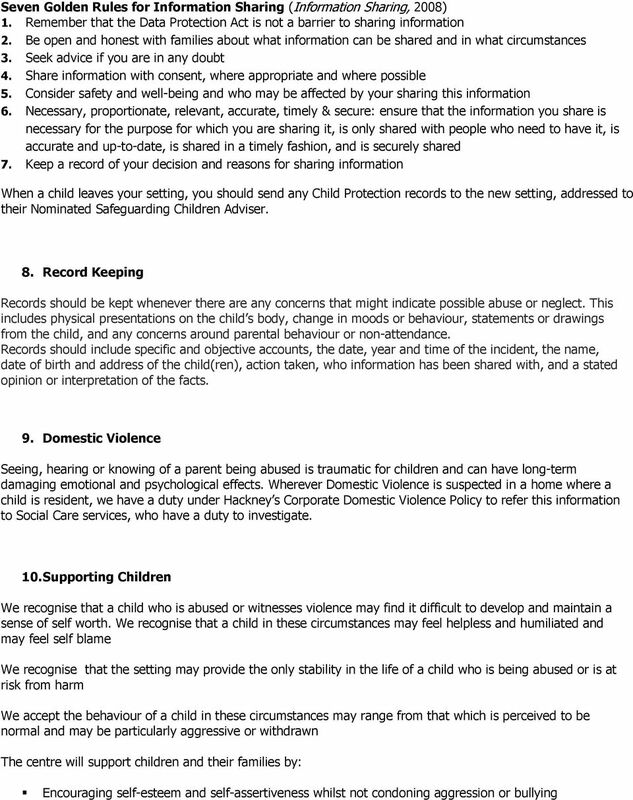 The designated senior officer for Child Protection is: Mrs.
What to do if you re worried a child is being abused Contents Preface Safeguarding Children 5 1 Introduction Working with children about whom there are child welfare concerns 7 2 What is a child in need?